The trend continues. More and more people are foregoing the daily grind and choosing transit, walking, and bicycling to get to work. Our new 2014 survey reveals that just 31% of commuters who work in Downtown Seattle drive to work! For a water bound city like ours, transit is the lifeline that enables Downtown’s economy to thrive. We’re also a city under construction, with dozens of office buildings and thousands of residential units being built, light rail extensions on the way, a new tunnel to replace the Viaduct, and citywide investments in bike lanes beginning to take shape. At Commute Seattle, we’re committed to ensuring that Downtown Seattle continues to thrive, and that every commuter feels empowered to make smart commute choices. More people are commuting to Downtown Seattle than ever, but the proportion of commuters driving alone fell to a historic low in 2014. 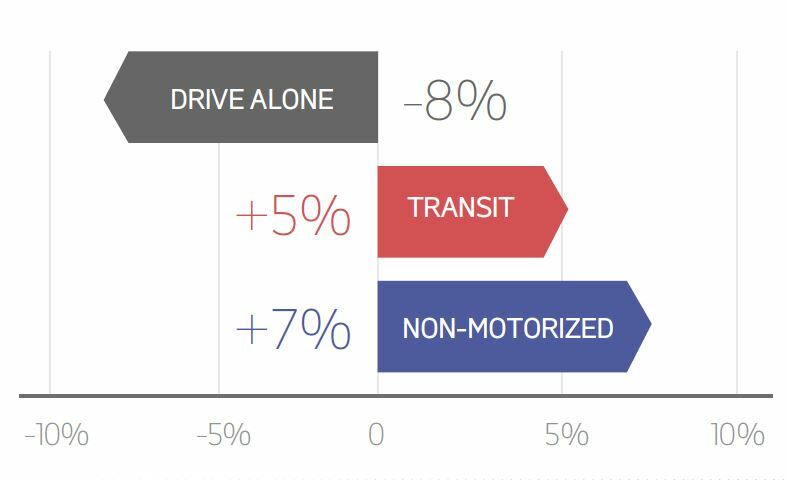 Just 31% of Downtown commuters now drive alone to work, continuing a strong downward trend from 35% in 2010 and 34% in 2012. Public transit continues to serve more commuters than any other mode, growing from 43% in 2012 to 45% today. Non-motorized commutes – walking, bicycling, and teleworking – now account for 15% of all commutes, another all-time high. More Downtown workers are discovering that the best commutes are short commutes. Downtown Seattle added 6,000 new residential units between 2012-2014, so it’s no surprise that transit and non-motorized commutes (walking, bicycling, teleworking) were the fastest growing modes. Downtown Seattle has added 26,000 jobs since 2010. Although an ever smaller share of commuters are driving alone, there are still just as many cars on the road. As our Downtown grows, all commute modes grow with it, increasing the need to invest in an efficient transportation network. Read full 2014 study here. Read the 2012 survey here.